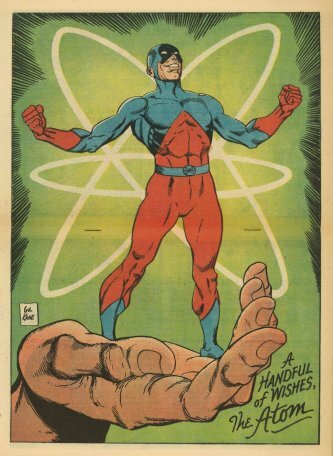 For no particular reason, the Atom has been on my mind. 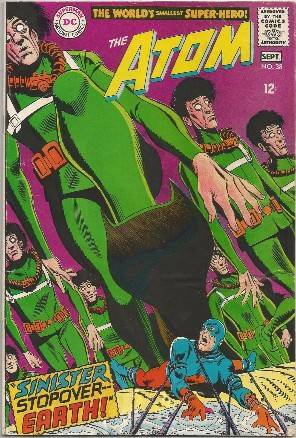 I did a little quick research and while I knew his series was relatively brief, I didn’t know that it ended at issue #38 and that Gil Kane’s work on the title ended with the prior issue. I’ve not seen #38, but the creative team doesn’t exactly fill me with anticipation. The cover was by Mike Sekowsky and Jack Abel with interiors by Sekowsky and George Roussos on a Frank Robbins script. I’m not sure exactly what happened, but there’s a note in the Grand Comics Database that says the next issue is when the Atom was teaming up with Hawkman. But…that’s not the issue we’re reviewing this time, faithful readers. I’ll get to that in just a second, but first a small prologue. When you collect old comic books, you learn a few things along the way. For starters, one of the weak points of a publication that’s decades old (almost 50 in this case) that wasn’t printed on the highest quality paper to begin with is the center leaves. It’s not at all unusual for them to be detached or even gone, so I’ve learned when I’ve purchased a book either through eBay or at a convention to check that out first. I’d be hard pressed to tell you where I got my copy of the Atom #34 from December 1967/January 1968, but this particular issue actually had a surprise bonus in it. When I went to check out the center leaves, they were attached, but then I noticed something. They weren’t from this book. It’s a cool 2-page pinup of the World’s Smallest Super-Hero being held in someone’s palm. On the back are two pages from a story and one panel has the baddie on it, by the name of Bertram Larvan. Did you know that the aforementioned Grand Comic Database has a search feature for characters? With that tidbit of information I was able to determine that this unexpected “bonus” in my comic was taken from the pages of issue #26. This is the first time I think I’ve received such an unexpected addition to one of my purchases. It’s a pretty nifty pin-up, too. 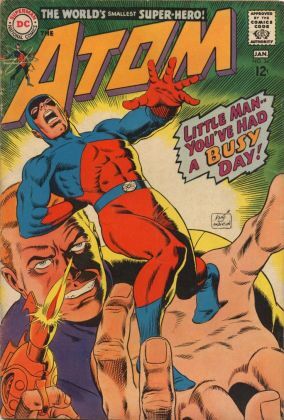 Okay, now back to issue #34, with a classic Gil Kane/Murphy Anderson cover. For some odd reason the text on the cover doesn’t match the splash page. As you can see, it says, “Little Man—you’ve had a busy day!” The splash, however, says, “Little Man—you’ve had a big-gang day!” Sadly, there’s no one left to ask about this strange discrepancy, as all the creators have left this mortal coil. In the case of this issue, we’re talking Editor Julius Schwartz, Gardner Fox on script detail, Gil Kane penciling with Sid Greene on inks and finally the wonderful Gaspar Saladino providing lettering duties. It seems they used to be members of the circus sideshow, which would explain a lot. 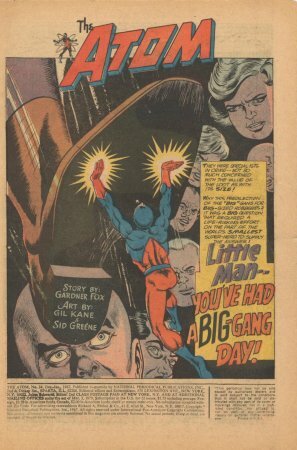 The newbie, by virtue of his capabilities as a magician and card sharp is promptly dubbed “Big Deal.” In the following panels, that would have made Bill Finger proud, Big Head shows off some of the gang’s booty, to include the world’s biggest book and biggest drum. They’re also in the process of planning a heist of the world’s biggest organ and bell to go with the drum. “Big Deal” justifiably asks if they ever steal anything that can be converted into cash. It is then explained that they’re about to steal the world’s biggest emerald that happens to be in Ivy Town, home turf of the Atom, but they’re prepared to deal with the Tiny Titan. A few days later, Jean Loring, attorney and fiancée of Ray (the Atom) Palmer, is reading the contents of a will to the heirs and among other things, a strong box is opened that contains that massive, 11,000 karat emerald. As if on cue, Big Ben and Big Cheese arrive, the latter armed with some stinky cheese that overcomes those in attendance, but the Big gang members are wearing nose filters. Ray Palmer, waiting to take Jean to dinner, is in attendance and manages to slip out of sight and shrink down into his heroic Atom togs. To the surprise of the gang, they’re soon fending off the battling Atom, who takes the gang members out one by one until Bertha ambushes him with a 16-pound shot that sends our hero to the bottom of a nearby lake. The gang reassembles and heads for their hideout to plan the next heist of the world’s largest coin and stamp, owned by the same millionaire. But what of the Mighty Mite? Well, he’s coming to, floating on a lily-pad. Thankfully his size and weight controls had him in a feather-light status, so he survived the assault, but now he’s got to hightail it back to Jean and company before they awaken. When he arrives, Jean Loring is already searching for him and when she notices he’s damp, she concludes he was thrown in the lake by the gang. She takes him home to rest and Palmer’s mind is going like sixty, trying to figure out where the Big gang will strike next. Later, they’re at the home of Horace Thurmond, and they each bring into play their individual talents to break in, leave the millionaire unconscious and to crack the safe holding the stamp. Soon they’re also hauling off the massive stone coin from the island of Yap, that weighs on the order of 200 pounds. Just then, a tiny speck flies off the stone and the Atom is wreaking havoc again with the Big gang. Taking on each one in turn, the World’s Smallest Super-hero is kicking tail left and right when abruptly Big Wig tosses a hairpiece at him that explodes, seemingly wiping the Atom out. In reality, the Atom sensed the danger coming from behind and swiftly shrank down to sub-atomic space. When he is back to his 6-inch fighting form, the gang has departed. Now it’s detective time. Where will they strike next? Later, having averted the worried visit of his fiancée, Ray Palmer comes up with the inspiration to take the fight to the Big gang by locating their hideout. He deduces that the hideout must be huge to house their over-sized loot and when they return to that location at Giant Caverns with their latest haul of the two-plus ton of silver, the Atom is waiting. Quickly he strikes, using their stolen items against them, by knocking part of the gang out with the giant book and nailing others with the huge drum. Out go the lights for the Big gang and the Atom heads for home for some well-deserved rest. Ordinarily, Gardner Fox can do no wrong in my book, but this was a pretty hokey bunch of villains. I get it that the “big” gimmick was being followed, but a guy using cheese as a weapon while another used wigs? I find it hard to suspend my disbelief quite that far. 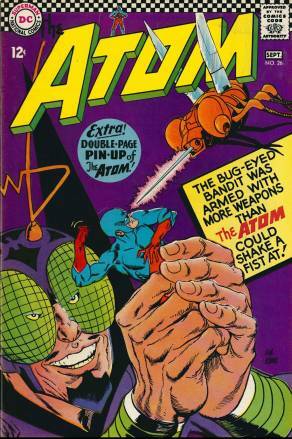 No wonder the Atom was able to make short work of such third-stringers. On the other hand, Gil Kane’s explosive action panels are always a treat and he didn’t skimp in this issue, even using some of his trademarks like having the lithe figure work burst through the panel gutters. It’s always a treat to see Gil’s work, particularly when there’s a good old-fashioned brawl. I think his work with hands is the equal of Steve Ditko and the expressive faces are always interesting as well. Overall, this issue gets a 6 on the 10-point rating scale and I remember once again that I need to beef up my Atom titles in my collection. His adventures are always different from the run of the mill. As always, we thank you for taking time out of your busy schedule to visit and hope you’ll do so again soon. Check out the voluminous research and reference efforts by the webmaster here at the dear ol’ Silver Lantern and I’ll have a fresh review for you on the 15th of July. Meanwhile, remember to express yourself with questions, comments or gushing praise. Just go to: professor_the@hotmail.com.